Dr, Braune teaches in the philosophy department at Gonzaga University, and is also involved with its Institute for Hate Studies. Contact her at standinsolidarity@yahoo.com.  This is Dr. Braune’s first SCAR meeting since arriving to Spokane approximately two years ago. Hate Groups, including Identity Evropa present an intentionally violent moment. Witness the Charlottesville riot. Fascism is not one coherent belief system. There is no creed one needs to adopt in order to be defined as a fascist. The label is more of a excuse to use violence. This fragile sense of identity must then be defended…with bad ideas, bullying, and always, eventually, physical violence. White person is being oppressed, therefore self and identity are threatened. Use violence to protect. Notice the posters. IE papered our area, often using a soft message, such as “Our Destiny is Ours,” “Our Generation,” Their strategy includes Normalization. They cultivate a image of not being a group of weirdos. We see Nathan Damigo under a sign of Identity Evropa. This group has only been around for two years. Richard Spencer. These groups appropriate rhetoric and tactics from the left. Example in Italy: CasaPound is a free clinic if you’re white, etc. James Allsup shows process of "Normalizing" and “Entryism.” He gained a leadership position in local Republicans party. Then he went to Charlottesville. He is a precinct officer for Republicans. He wants to be accepted in society, etc. Martin Sellner and Brittany Pettibone (she is 19 years old, living in Post Falls. She travelled to Russia to meet with one of the most famous racist in the world. Sellner is hoping to learn from Allsup. Modeled on European far right. Torch-lit marches are typical, both in Europan and American, and in Spokane. Britebart, Steve Bannen promoted IE e.g. Sellner. Spokane defeated fascism, July 1938 Socialists and organized labor kicked out of town the Hitler Silver Shirts. Countering False Myth: Talking about fascist, especially identifying groups or individuals by name, always strengthens the fascists. Countering False Myth: “De-platforming” violates freedom of speech. Countering False Myth: We need to give fascists a hearing (public debates, etc) so that they feel less persecuted and in order to offer arguments against them. This only allows them to spread their ideas further. Positive example: Bostonian’s reaction to Charlottesville. Positive example: History in Spokane: We’ve got work to do to defeat them again. Positive example: Redneck striking miners trying to stop racism and militias, but lost energy. *Does capitalism, hierarchy, and macho masculinity reinforce fascism? Fascism tends to reinforce capitalism, resists far left, it “capitalizes” on people revolting against oppression and economic injustice. *MTFU (Man The Family Up) does good, but there is definitely a macho attitude. It’s an aid organization, but their symbol includes a scull with American flag, they talk about restoring down-home American Values, and fly the Confederate Flag. *How do we make our community less hospitable to Fascists, especially when there are levels of skepticism? Think about sub-cultures you belong to. These represent different cultures you’re in. Proactively warn people about fascism. They’re a lot people who are reachable. Don’t cut off and don’t just nod and smile with people you disagree with. Engage with people. Fascists are doing this, so people on the center, moderate right, and left need to do the same. Articulating a better message than the fascists. **Most Important: Form a United Front. When Trump loses, we need a United Front, consisting of conservative Republicans, various organizations (including labor), and many, many individuals. *Positive example: Young Workers Committee AFLCIO observed workers with guns and KKK emblems hanging out in a area with people of color. Labor Unions worked together to stamp this out. *Remember: Fascism is a response to a crisis. So we need to think of what the crisis is. e.g. the immigrant crisis in the USA and elsewhere. *Positive example: Portland this week. Citizens surrounded their ICE Office for days, which was effectively shutdown during this period. Mass protests can be effective. There are so many of us. Fascists is a fairly small, about twenty four Identity Evropa people of all ages in our area. We’re going to win, but we have a lot of work to do. Victims rights and dog whistles. *Do we need a rapid response team to get the word out? There is common language with rapid response, BUT it might backfire. It’s much better to have a continual response e.g. constant picnics with immigrants, affirmation of minorities, working for equity and justice. *Build strong a strong community with positive messages. *Comment: Long term strategy of fascists has been to infiltrate police and military. This problem is also local, we must be on guard. Make your voice heard. Write a letter, etc. *Comment: Generally speaking there are not a lot of young people are interested in fascism. But fascist recruit all ages. Portland showed itself to be against fascists. *Announcement: There will be a labor protest at the Spokane Greyhound station on July 7th. *World Relief: IE strategically targeting World Relief. The Rev. Finny spoke of making friends with immigrants, and being public about supporting them. *The City of Spokane has a social media process called “Spokindnes” Hit up the city’s hashtag. Don’t wait for something ridiculous to happen. Make acceptance and respect normal. *Social media: share the good things that are happening. Share stories of my friends who are immigrants. Use your media power, sharing the stories. **This is the work for all people of good will.